Live chat best practices can help organizations to convert website visitors into potential prospects, reduce churn rate by extending support across their journey, reduce conflicts and drastically improve resolution rate by engaging customer through visual tools. Why you need live chat software in the first place? Customer service is no longer talking over phone or email. Customers expect quick solutions to their queries. Companies are finding new ways to provide exceptional and real-time customer service to customers. That’s where live chat comes in. According to g2crowd Live chat has a 73% satisfaction rate as a way for customers to interact with businesses. Many big companies have already implemented live chat software in their business to deliver superior customer service and more and more companies are experiencing the benefits of live chat software, however, there are a couple of questions that you need to address before considering live chat as an online customer support tool. What will be the cost of transitioning from a typical email based support system to a live chat support system? How many customer requests do you receive in a day? How many of them are simple common queries? What is your agents' utilization time? What are your operating hours? How many chat requests you receive during offline hours? What kind of customers do you serve? Do they use smartphones and the internet to communicate? Once you have the answers to these questions, the next step is to find the right live chat solution for your company but having a live chat software does not solve the problem, the key to deliver engaging live chat experience lies in following proper live chat guidelines. Why there is a need to follow live chat practices? By implementing live chat practices in your daily communication, you can ensure consistent customer service across all your customer touch-points and organization hierarchy. Here in this blog, I have mentioned the top 15 best live chat practices that can help you to deliver great customer service and experience. The most important aspect of live chat practices is to first start thinking like a customer, understand their needs and provide a contextual solution to their problem. This is the first successful live chat practice for customer service. To enhance the experience of the customers with live chat software, make live chat available on the right side of the page. So, when a person opens up a window on your site; before going any further, he/she will go with his/her instinct. This means they will do what they like to do. Again, it must occur in an easily visible area. Keep a little but bright button to click on the chat window. This colorful bright button will always catch eyes without irritating them for scanning the whole page to find other things. Because, it is important to keep options for your audience to connect with you, but the more important thing is to give them time to get interested in it. One of the crucial aspects of implementing live chat practices is to offer live assistance across your popular web pages. These are the pages which are most often visited by your customers. All these show how important it is to install a live chat window on every webpage. Because, it happens most of the time, that some of the visitors reach directly to a page of your site, which is not the home page. In that case, you may miss the chance to get in touch with them. Implementation of live chat software makes customers happy and finally boost your conversions and sales. CUSTOMER ATTENTION! You heard me right. At times, it happens that your customer is roaming around your website aimlessly without knowing where to start or where to find the right information he requires. After a while, when your customer fails to reach the right location or web page, he simply leaves. Congratulations! You have one more drop out. But, you didn’t do anything. Right? Thankfully, that’s the big mistake you just committed. You have failed to grab the attention of your customer when it was needed the most. Take the first step. Automate the first approach of the live chat tool which will pop out chat window exactly when your customer seeks it. I bet you already know the stat which says that it takes twelve positive and happy experiences to make up a single negative and unresolved experience. Make AI-driven conversations a part of your daily live chat practices. We are already witnessing how AI-driven chatbots are helping organizations to improve engagement and boost conversion. Through sequence based chatbot, you can give your chatbot a brain, where it can anticipate customer needs and take the course of conversation in a contextual way. 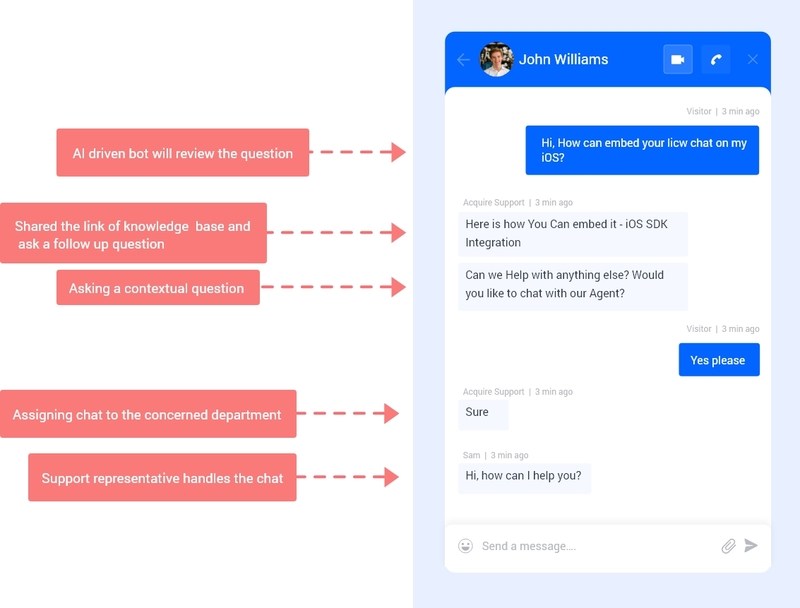 Al driven chatbots can read a customer's question and map it with common phrases and keywords and can then suggest the next course of actions - like forwarding it to the right department - inserting relevant FAQ pages or directly answering the question. Of course, not every conversation can be handled by chatbots but it can definitely help you manage all your initial conversations - so that your agents can focus on more complex customer issues. Sales bot is a new innovation and trend among chatbots, which are exclusively built to manage conversational marketing and to take over the entire presale process. 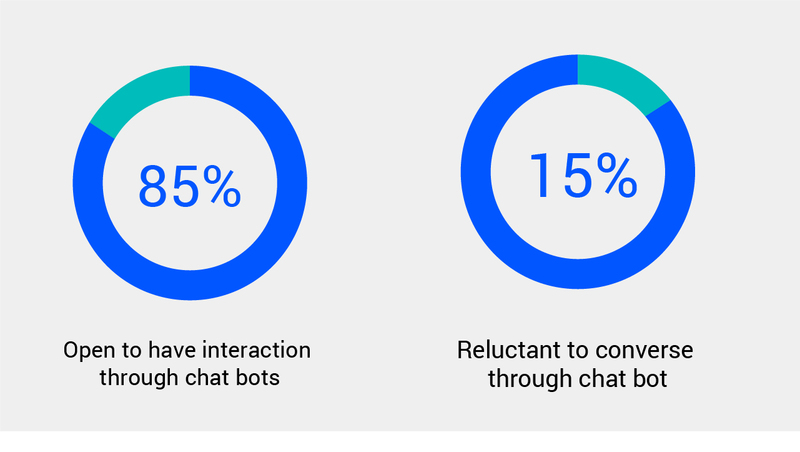 Similarly support bots are built where you can ask your customers to fill a pre-chat surveys to know what sort of issue your customers have before even they begin typing. With a thorough knowledge of their customers' behavior, businesses can make the initial conversation much more engaging and easily qualify it for conversion. This seems like a no brainer but this is, in fact, the most important live chat practice. You may lose the customer if you don’t give the proper response to the customers. Do you know that last year, 67% of global online users hung up their phones as they failed to reach a real customer care executive at the end? Research data says that none of them had waited more than 2 minutes. Moreover, 80% of global users believe that smaller companies are doing far better than larger brands. It is very important to take care of a few things to make communication crystal clear. This is also one of the most significant live chat practices for customer service. Many live chat agents find it difficult to understand and communicate with the customers in a cheerful tone. Personalized Chat – By starting a chat using a visitor’s name, you can personalize your greeting and responses. Make a connection- Use customer service representatives’ names and photos so that customers get a human connection and this will build trust and makes the communication smoother. Be positive and friendly – It is very important that you always stay positive and friendly in a live chat. Use a positive tone and voice so that it doesn’t seem rude to the customers. Make use of exclamation points in your greetings. Use of voice and video call - Start using advanced technologies like Acquire, to make voice and video call, remote co-browsing, screen sharing with CRM (customer relationship management) with a more humane touch of yours. Get this straight. 75% of customers still believe in this digital era, that it takes too long to reach a service representative. A high response time leads to high abandonment rates and live chat is the best communication software to overcome this gap. In today’s fast-paced world, no one likes to wait. Customers expect an instant solution to their queries. 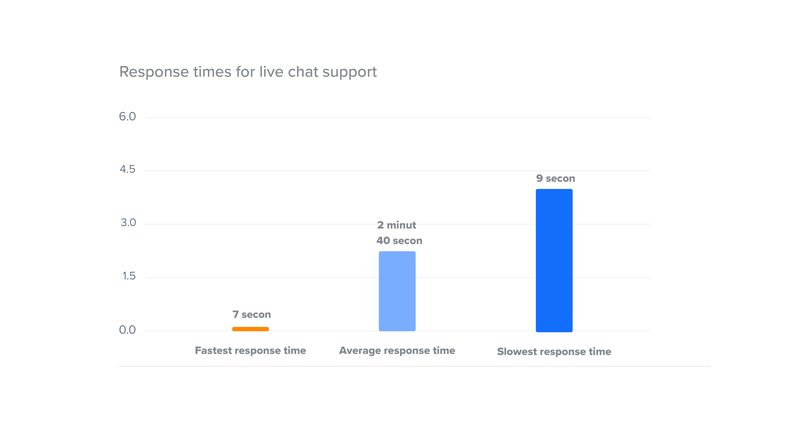 Through live chat, you can slash your average response time down to almost an 'instant replay’ level. The current standard is less than a minute and you can still push it down further with the help of live chat tool. With live chat software, an agent can instantly reply to the visitors and thus this will reduce response time. Even agent can proactively start the communication with the customers and can suggest them the products based on their purchasing behavior. This will boost the conversion rate and sales. Accept chat automatically and inform the customer that your agent will revert back. Set automatic response to all incoming customer chat sessions. Allow your agent to access the customer profile and past conversations to identify the problem area before starting the chat. Sometimes, it happens that during a conversation via live chat, the agent tries their best to explain to their customers, but they don’t get it. In this scenario, the screen share is the best option. By installing Screen share, the agent can easily access the entire screen of the customers. With the help of screen share, users can share data or give demos on their screen. Lets’ have a look at advantages of using a screen share with live chat. The most important feature of this tool is the “view” and “show” mode. Companies like Acquire offers screen share tool to offer top-notch service to the customers. This is also one of the important and best live chat practices for customer service. Co-browsing is one of the essential features of live chat software. When co-browse integrated with live chat it enhances the level of direct communication between the agent and customer. An agent can access a customer’s web browser window and can easily guide the customers by highlighting different web points on a particular web page. The customer service agent can continue their live chat with the customers while viewing their computer screens. Thus Co-browsing, when integrated with live chat reduces response time and develops real-time support for the customers. Are you worried about your safety? Please don’t, because client privacy is considered as the first priority to program this software. The whole communication is secured with PCI DSS encryption standards. With this, only a support agent can follow the client’s browser window and move a cursor to help them in real-time with the utmost safety and security. By integrating the help center or knowledge base within your live chat program, your agents can offer support to customers at their fingertips. Even if they lack the complete knowledge about customers problem area, he can still provide support by directing them to the relevant help document. With this live chat practice, you can address customer queries swiftly by adding images, screenshots, and files in the form of reply. Figure out tags that your readers would use to search for information. Create tags that can be associated with keywords and makes it easier to search the articles. One of the finest examples of integrating knowledge base in live chat program is of Zapier. 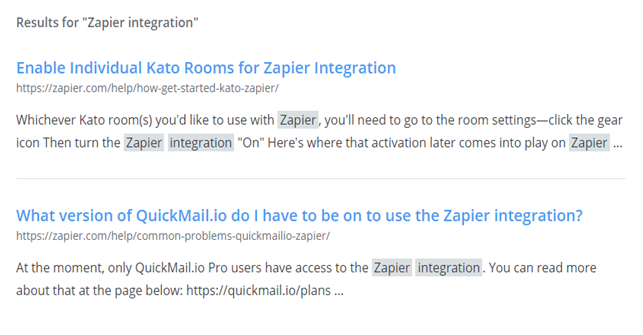 Whenever their clients look up for Zapier integration, they came up with appropriate articles. As they have merged proper tags in their knowledge base. As discussed above Tags are the most underutilized feature of live chat software. Tags help you to categorize chats and route it to the concerned entity. 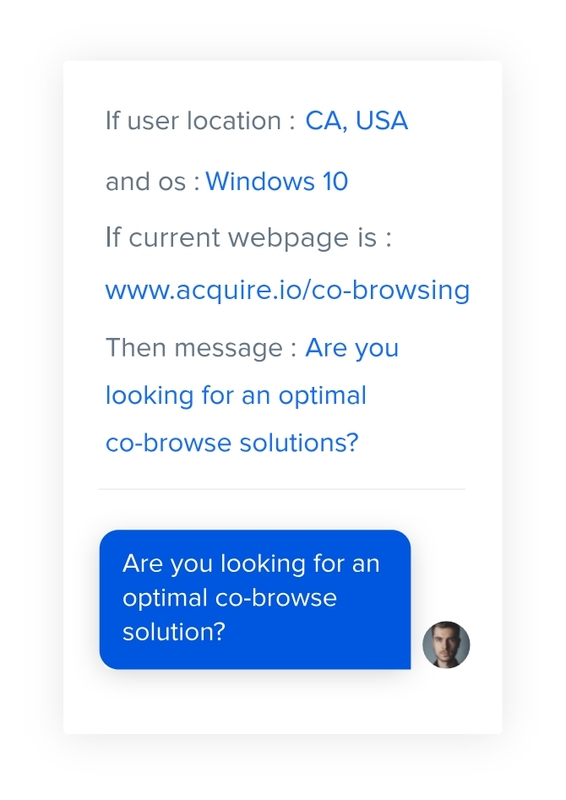 If you sit and observe, you can categorize the set of questions, for example, our customers consistently seek helps in configuring co-browsing to their communication channels, we have tagged it so the query gets easily forwarded to the right person. While chatting, times come, that to explain something thoroughly, agents need to share other media files with customers, like a video demo or a magnetic content or a one-way video call (to hide client’s facial identity), or something else. You can invite them to video conference too. This is what the new software technologies can do for you with a twist of your finger. Using these technologies, you can elaborate on anything you want for your clients, also by entertaining them with other media means. What if you were chatting and, then get caught in some other staff or some hardware issues or else? Most of the time clients end up incompletely in the chat window. When they return again, forget some staff and, feel the urge to get a hold for the past. Admittedly, it’s pretty impressive, if your customers can start chatting where they left it off. According to Capterra, CRM market prediction says to get a hold on the market for $36 billion in 2017. 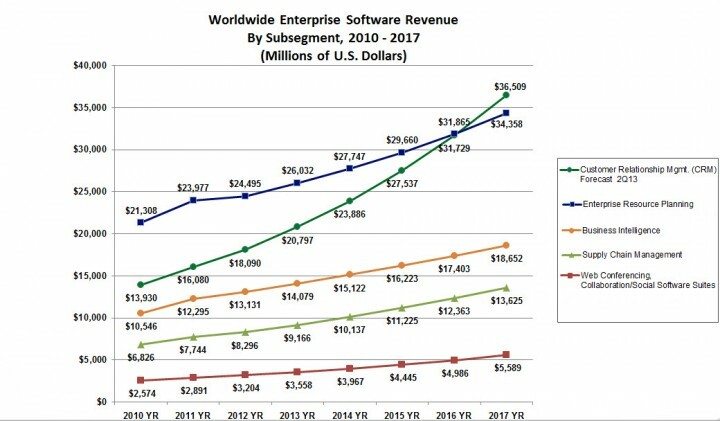 (Source: Gartner). CRM helps to sync individual customer identity, like name, email id and their choices and requirements. So, why not using your taste buds at least once with software like acquire Integration with InfusionSoft and vTiger CRM? Live chat metrics help you measure your service level standards (SLAs) and let you quantify live chat performance in terms of revenue goals. By adopting the right live chat metric you can measure your team performance against your defined KPI ( Key performance indicators ) and shed light on your shortcomings. Create SLAs in terms of customer support experience and implement it across the organizational hierarchy. Break you SLA into a series of smaller milestones, so you can measure and report from an individual basis. Exactly see how much of your live chat best practices is working for your organization. Users are the track setters for business. Hence, your success is in the hand of your users and, how comfortable they are with you. The best way to provide them the utmost satisfaction is through chatting more and to understand them. Your only need is to know what your clients need. Ask them for feedback, reviews, etc. And go for the track they are tending to. Lastly, follow the footsteps of your visitors and, be the king to hold all of the triumph cards by tracking them. So, what's your take on it? Do share with us.